BMW may build X4 | What Car? 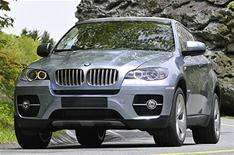 BMW has said that it could build a smaller version of its X6 4x4, possibly called the X4. Encouraged by the success of its X6, which sold double its target of around 40,000 cars worldwide since its launch, BMW now says there could be room for a smaller car in the same mould. However, BMW has said that no decision has been made, but that the demand for sporty 4x4s has not diminished. BMW could base the car on the new X3, which is due to be launched later this year.